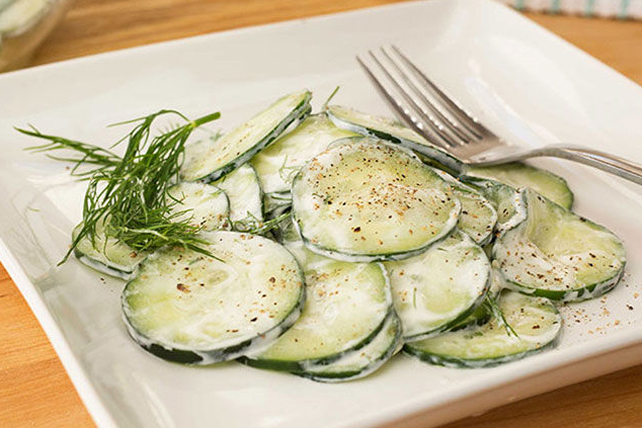 You can't beat the cucumber-dill combination for a refreshing dish that smells as good as it tastes! Case in point: this farm-fresh cucumber salad. Mix sour cream, Miracle Whip, dill and lemon juice until blended. Place cucumbers in large bowl. Add sour cream mixture; mix lightly. Refrigerate any leftover salad. Use as a filling for pita bread halves. Utilize your garden-fresh cucumbers in this easy-to-prepare salad.